A goat has a soft, downy undercoat covered by a fine, coarse outer coat. Without routine care and proper nutrition, a goat’s hair becomes dry and brittle, making it lack softness -- and look less lustrous at show. You can restore your goats' hair softness with simple TLC. Any pet with hair needs brushing, including goats. Brushing your goat with a firm-bristled grooming brush helps soften his hair by removing dead skin and loose hair that causes his coat to look and feel rough. Brush your goat from the back of the top of his head down his back toward his tail, in long even strokes. Work in the direction the hair grows, making sure you get deep enough to remove the shedding hair from the undercoat. Brush his legs, chest and belly as well. Washing your goat helps keep his hair soft and removes many harmful pests and parasites, like lice. Use a shampoo specifically formulated for goats or livestock. Wet his entire body and pour the shampoo directly on his hair. Rub it in making sure you reach the downy undercoat. Rinse the soap off completely and follow up with a coat conditioner. The conditioner helps remove mats and tangles from his hair. After he dries, spray his coat with a leave-in coat conditioner that contains natural oils for added softness. A healthy coat starts on the inside. If you goat is lacking important vitamins and minerals like zinc, copper and vitamin A, his coat may suffer; it may simply look lackluster or it may fall out. Therefore, feeding your goat a balanced diet that is rich in vitamins and minerals ensures he grows a healthy coat that is soft to the touch. However, if diet alone does not work, a veterinarian may need to offer a vitamin supplement. 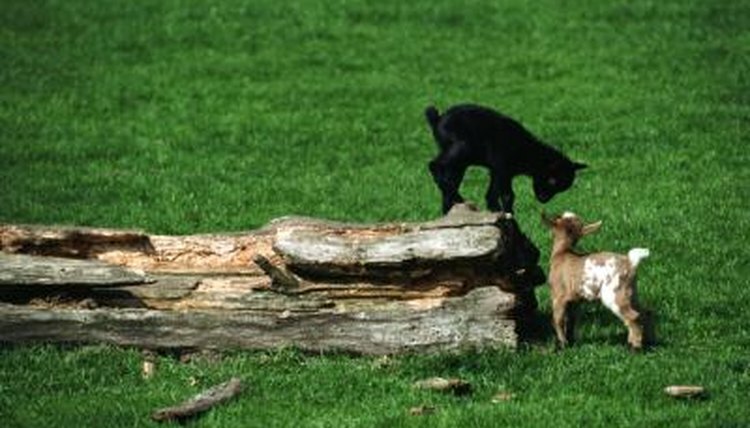 Goats are susceptible to skin infections caused by parasites and bacteria in damp areas. To help keep your goat’s coat healthy, make sure he stays dry during damp, rainy weather. Provide him a three-sided shelter and remove any wet footing immediately. Inspect your goat often for signs of mange and other skin conditions, which include scaly, dry skin and hair loss.